Over the past couple of weeks we've continued our work at Allan Bank, where our work has focused on a section of path which is very undefined. To cope with the number of visitors when Allan Bank opens to the public in a few weeks time we've had to make the route more obvious and also sustainable. 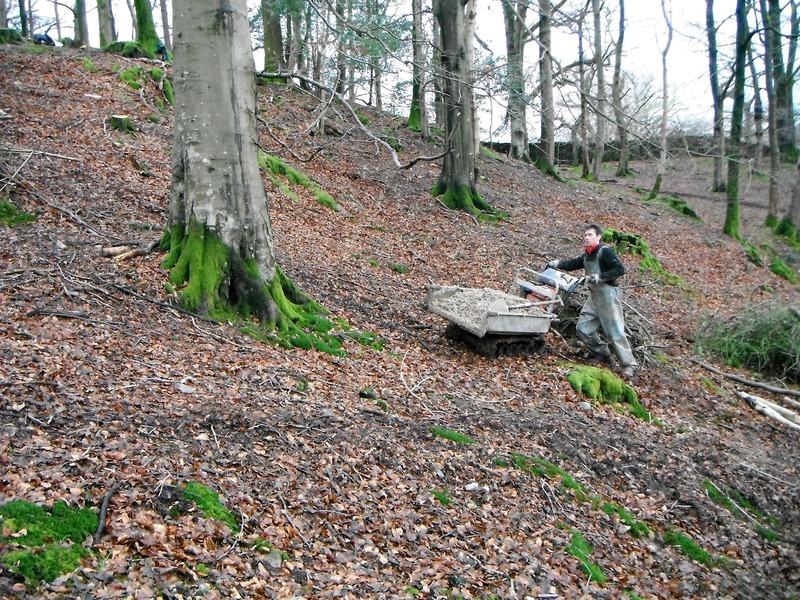 The first job was to decide which route to take and start clearing back the leaves and digging out a shallow trench. It's been great that we've had so much volunteer involvement as they've really helped speed things along. The Fix the Fells volunteers have managed to find some spare time in between their "day job" of attending to the upland paths, and managed to fit in several work parties. With the new path line properly defined, we've again used tree trunks that have been felled as part of our woodland thinning programme to edge the path. The next job was to add some wooden risers to the steepest sections of path. These are needed as due to the incline it is more likely to erode and also more difficult to walk on. With all the risers in place we needed to get the gravel from a pile next to the house over to the new path. First we had to shovel the gravel from the heap into a trailer, so we could transport it a short distance by road to the nearest access point. Once here it was shovelled out of the trailer and into a power barrow. Finally, the gravel was moved over to the new path and shovelled back out again. This was repeated numerous times throughout the day, and that's a lot of shovelling! Once the gravel was nearer to the path it was then moved using wheelbarrows to exactly where it was needed. By creating a path like this it will make it much easier for everyone to get around and enjoy the woodland at Allan Bank. Given a little time the path will start to blend in more with it's surroundings, but it'll still do the job it's been designed for.